Braids are always fun to experiment with, and if you have already mastered some of the simple, standard braid types out there, you can still expand on these in so many ways. From upside down braided buns to boho braided crowns, here are 10 creative braid hairstyle ideas to try. Crown braids look quite sophisticated, but still have a down-to-earth, boho feel about them. Just like with any braided hairstyle, crown braids are best carried out on hair that hasn’t been washed for a couple of days. 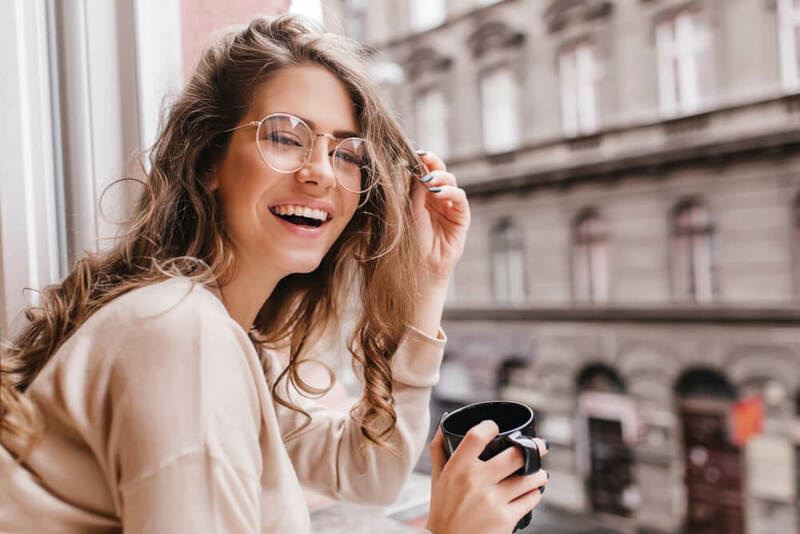 Because this means that your hair will contain more natural oils, which not only makes it much easier to manipulate into a braid, but also helps to hold your braid in place for longer. Ready to get started with your crown braid? Begin by creating a part down the middle of your head, so that you can separate your hair into two equal sections. Then, braid each section of your hair into a standard three-strand braid, starting just behind your ears and continuing downwards, securing the ends with an elastic band. Next, take one of the braids and lift this up over the top of your head. Pin it along the way with bobby pins to hold it in place. Do the same with the second braid, but, when you bring this over the front of your head, try to cross it over the first braid, so that you don’t end up with any ends showing. You will likely have a few stray strands after creating this style, so make sure that you hide these away with some bobby pins. Try using your fingers to gently loosen your braids. This will give it some extra volume, as well as a more casual look. Alternatively, pull out a few strands from the front of your head to soften up the crown a bit and to frame your face. Yes, this spiral braid does look quite complicated, so let’s not pretend that it’s a hairstyle you can whip together in a few minutes. However, it will definitely make your hair a talking point – in a good way! Wondering how long this hairstyle will take you? At least half an hour. You may be able to get this down to 20 minutes once you have mastered the style, but you will need to set aside a significant portion of time for this look. 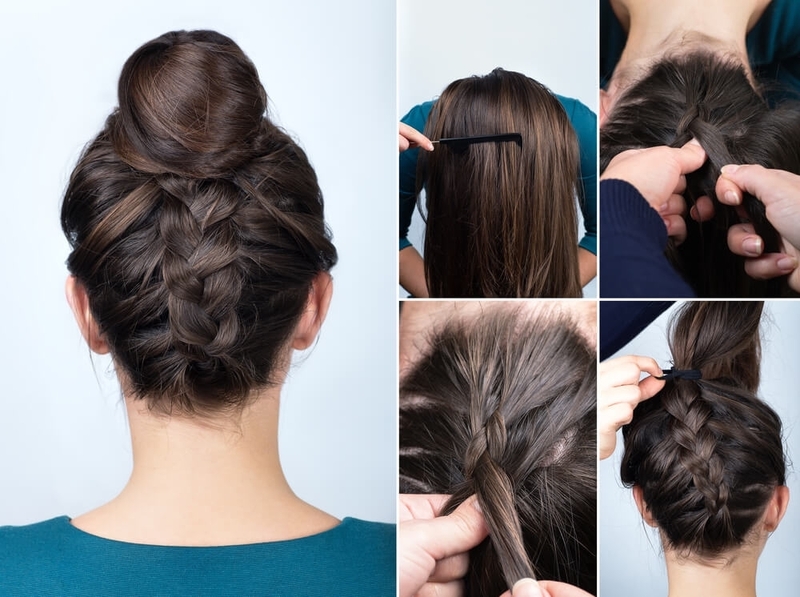 This hairstyle combines two classic favorites – a braid and a bun. It does take a bit of practice to perfect this style, but the time you spend doing this will be more than worthwhile, as you will then be able to put this style together in just a few minutes. Give your hair a spray with some hairspray, and you’re ready to go! Does your braid look too small? All you need to do to give it some extra volume is gently pull at it from the sides, using your fingers. 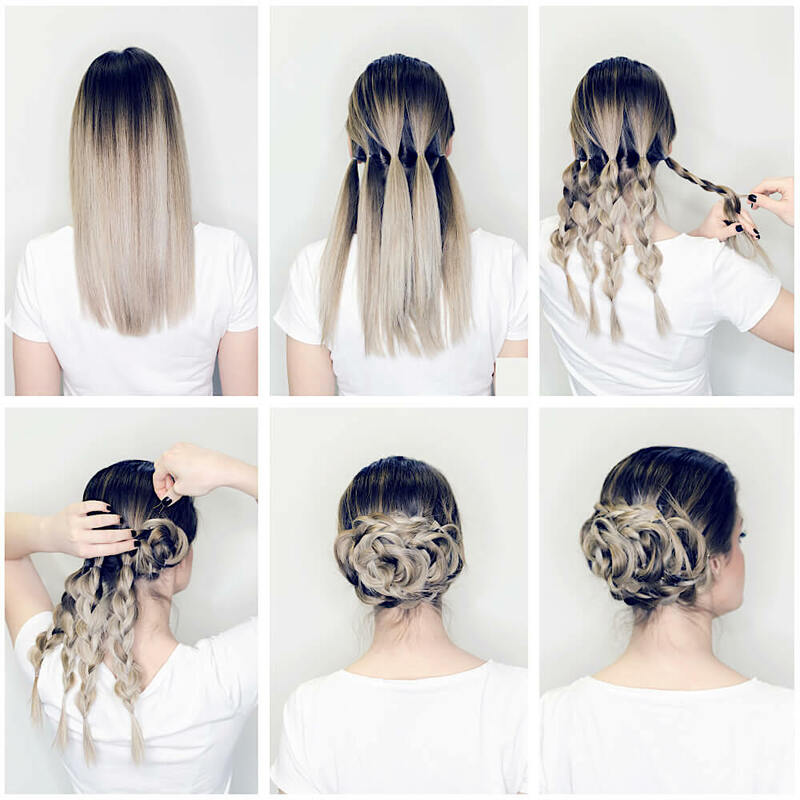 There is no denying that three-strand braids are the easiest of all the braid types to put together, but it can sometimes be difficult finding elaborate-looking braid hairstyles that make use of three-strand braids. This double three-strand braid is exactly that, putting two braids together into one to give the standard three-strand more texture and interest. All you need to do is section your hair into three, so that you have two sections on either side of your head and one down the middle. Take the middle section and braid this into a three-strand braid, tying it off at the end with a clear elastic band. You will now be left with three sections of hair, one of which is braided. Take these three sections and turn them into a three-strand braid, tying it off at the bottom. This style doesn’t take more than a few minutes to do, but gives the braid a much more complex appearance. This braid is quite simple, but that makes it perfect for everyday wear. Thanks to the way in which it keeps your hair high up off your face, this is an ideal hairstyle for working out. Simply tie your hair into a high ponytail, securing it at the base of the ponytail. Then, turn that ponytail into a braid. That’s completely up to you. A three-strand is the quickest and simplest, but this style works well with other braid types too. 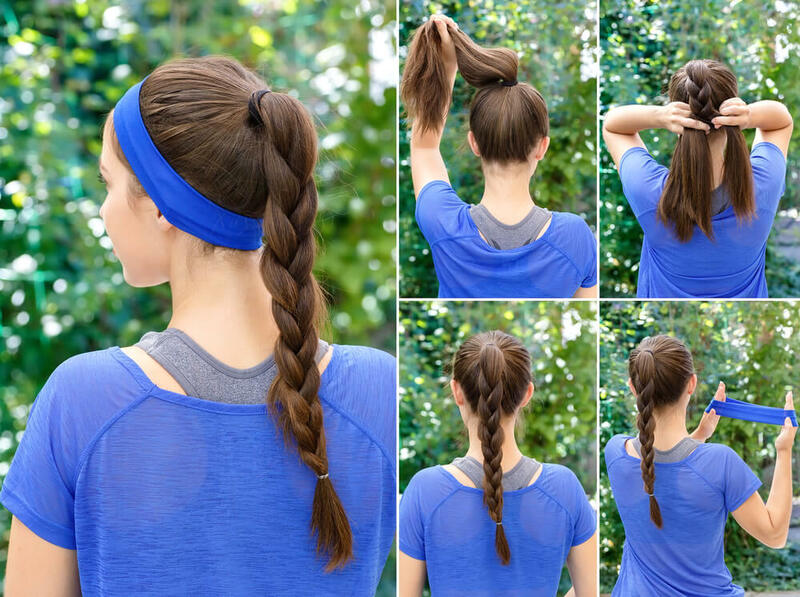 Once you are done, tie off your braid at the bottom, and, if you want, top with a headband. Buns work well for just about every occasion, and this hairstyle gives a standard bun so much more personality. This braided bun looks a lot more complicated than the one above, but it is just as simple to create. Begin by tying your hair into at least six sections, depending on how thick your hair is. The more sections you create, the larger and fuller your bun will be. 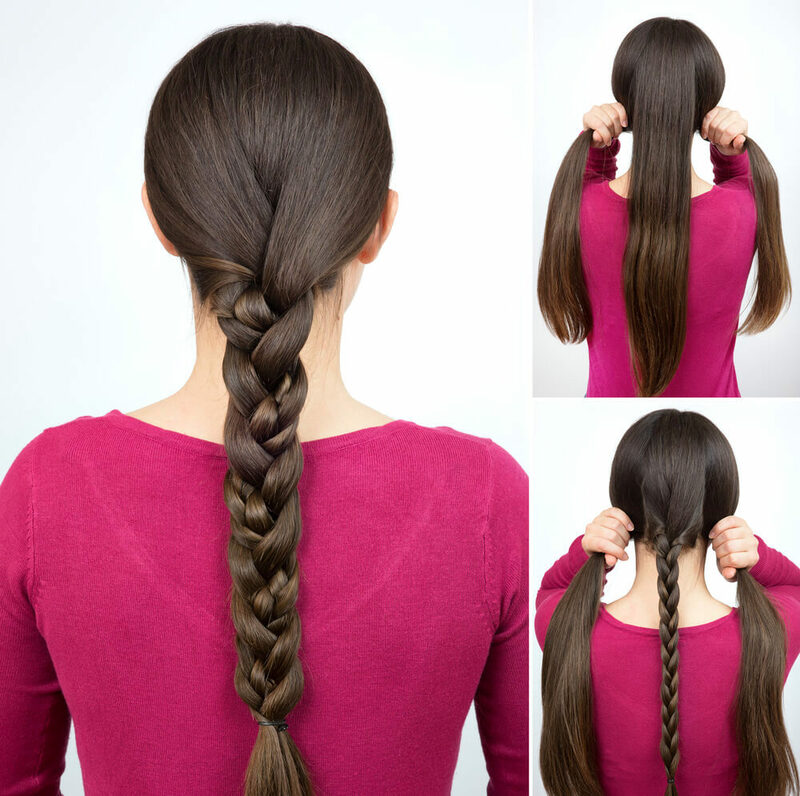 Tie each section into a three-strand braid, tying these braids off at the bottom with a clear elastic band. You will then be left with six, or however many ponytails you tied, braids. Starting at the outer edges, take each braid and wrap it around itself, so that it forms a bun. 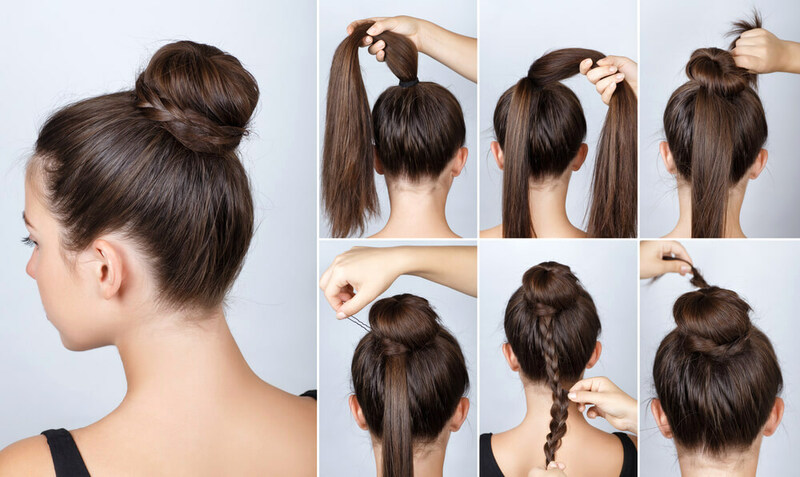 Pin each bun into place using bobby pins before moving on to the next braid. Any stray strands can also be tucked away with bobby pins, although try to place these underneath the buns so that they cannot be seen. Once you are done, give your hair a spray with some hairspray to help hold everything together. 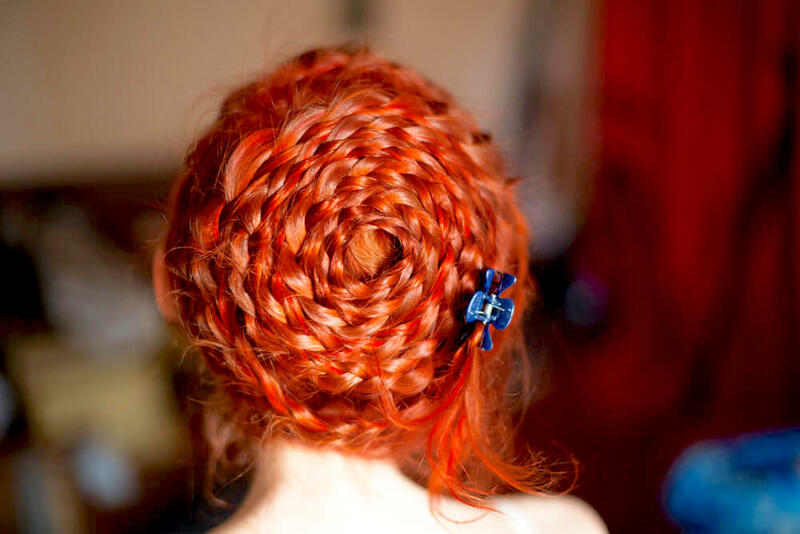 For those of you who like flowers, this is a hairstyle that you will love. Fake flowers are available in just about every shape, color and size, and local craft stores, as well as many websites, will sell strings of fake flowers. All you need to create this look is one of those strings of flowers, as well as a bobby pin and an elastic band. Make sure that the flowers you choose aren’t too large, especially if you have thin hair, as you don’t want the flowers to be overpowering. Got your string of flowers? Use your bobby pins to pin the string of flowers into your hair, placing the pin at the point at which you intend on starting your braid. Then, simply braid your hair. Depending on how thick your hair is, you can either use the string of flowers as one of the braiding sections on their own, or incorporate it into a section of hair and braid with all of this. Tie off the end with an elastic band and you’re all done! Just like with some of the other styles on this list, the type of braid that you create is completely up to you. This style is so versatile, and flower strings can easily be incorporated into just about every type of braid out there! Waterfall braids are beautifully feminine, and are so on trend right now. A waterfall braid will work with just about every hair type, but does often tend to look better when there is some texture in your hair. Since it is easier to create this style with straight hair, wait until you are done with the waterfall braid before gently curling the rest of your hair with some curling tongs. The braided bun was mentioned above, but if you would like to take this a step further, then give the double braided bun a try. Begin with a center part. Even if you usually wear your hair in a side part, a center part will really make this hairstyle so much easier to pull off. Then, simply tie your hair into two pigtails on either side of your head. Then, braid each one into an easy three-strand braid, before tying the ends off with an elastic band. 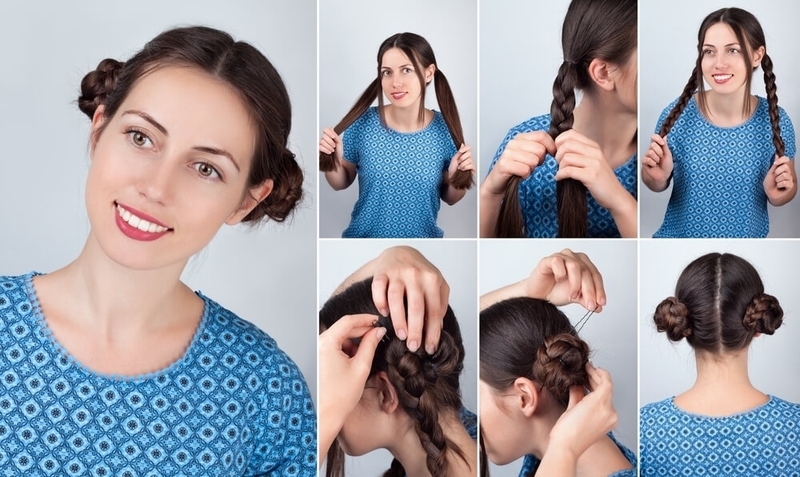 Take one of the braids and lift it, before wrapping it around itself to form a bun. Use either bobby pins or another elastic band to secure this in place before repeating with the other side. A spritz of hairspray to hold everything in place is all you need to do next. As mentioned earlier, braids work so much better when your hair hasn’t been washed for a couple of days, as this gives it more natural texture. Already washed your hair but want to give one of these styles a try? Apply some dry shampoo to your roots and rub this through your hair. This will give your strands the extra grip they need to easily be braided.